Washington DC startup Meplus 1 is a new company looking to make it easier to pay in a variety of locations. Meplus 1 is an iPhone app that will soon be available on Android as well. The app integrates with already existing POS systems like Micros, POSitouch, Dinerware, Digital Dining and POS. Customers use the iPhone app to open up a tab at restaurants and other establishments. As they order they add to the tab and at the end of their meal or transaction they use their credit card information, safely and securely stored in the app, to pay, hence making life easier for consumers, merchants and busy servers. The app is similar to Tabbed Out and the TGIFriday’s app, but more robust in the POS systems that it’s capable of interacting with. Now at the end of a meal a customer doesn’t have to wait for the server to bring the check, take the check back to reconcile and then bring the check back to the table. It’s also safer for customers in that they don’t have to hand their credit card over to the server. It’s all done within the app. Meplus 1 is also not limited to just restaurant tabs. Their app is great for bars, lounges, restaurants and night clubs. They also provide five layers of security which prevents fraud and chargebacks which can be costly to both consumers and merchants. We got a chance to talk to Justin Broady, co-founder of Meplus 1. Check out the interview below. 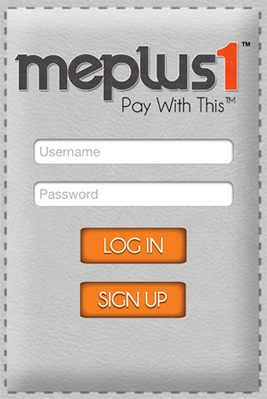 Meplus1 is the antidote for lost credit cards and makes life easier for consumers, merchants, and servers! We have made the entire payment process a simple, secure, and easy so merchants can give your customers a more genuine experience in your establishment. Meplus1 is a free app for iPhone, and soon to be for Android, that lets consumers OPEN a tab, VIEW their tab in real-time and PAY the tab at their convenience. We’ve integrated directly with some of the top Point of Sale Systems. Right now we are compatible with Micros™, POSitouch™, Dinerware™, Digital Dining™ and POS™. Kyle O’Connor, Co-Founder and CEO: At the young age of 21, Kyle co-founded his first company; a graphic design firm (KO Classic Productions), which became a respected leader in the industry. KOCP’s work has been featured all over the United States in places such as Las Vegas, New York, Miami, Washington DC, Houston and international places like, Croatia and Chile. His experience in working with high clientele such as the NAACP, IBM, Infiniti, Coors Light, and State Farm, has allowed Kyle to see the value in building strategic relationships while building a brand. As a graduate of Marymount University and a successful entrepreneur, Kyle has certainly earned a high level of respect from his peers and competitors. Outside of keeping up with the world of business, his main interest include playing basketball, traveling, and a new found passion for boxing! Justin Broady, Co-Founder and COO: Justin attended a small college in Norfolk, Virginia to pursue a major in the Computer Networking and Computer Science fields. In June 2009, after attending school for two years, Justin was offered the Director of Sales position at KO Classic Productions, LLC. (KOCP). Where he went on to close deals from logistics companies to entertainment labels. Around April 2011 Justin was approached by Kyle to team up and build a product that would make the consumer experience of going out more enjoyable; thus the birth of Meplus1™. Justin’s drive and willingness to succeed yields a high level of leadership to the meplus1™ team. His business savvy and innovative approach adds tremendous value to his role as head of operations. Justin brings a great deal of creativity, energy, and vision to the company. His main responsibilities are to oversee the day-to-day operations in product development and customer relations. There is no better person to see things through than him. When Justin isn’t in the office he enjoys fishing, playing poker, and reading the success stories of Entrepreneurs! Currently, we are based in the Washington D.C. Metropolitan area, but plan to expand to different regions of the country. The startup culture in Washington D.C. is actually quite different, being that D.C. is really a who knows who type of city. There are different networking events and socials for Entrepreneurs to attend, but tech startups are scarce. Our area isn’t considered a tech hub like a New York or California, but we hope to put D.C. on the tech world map very soon. With Meplus1 we have two main focuses; Consumer and Merchant. For our Consumers our goal is to provide a more secure and convenient way to checkout at bars, restaurants, lounges, and nightclubs. What our app does is it make the consumers experience more enjoyable and the merchants job easier. We like to say, it helps organize the chaos. The worst thing in the world is having to wait for a server or bartender to walk past to close your check; especially in a crowded environment. Then waiting for them to come back with your card, and so on and so forth. In one of our team discussions we heavily debated allowing users to order from their device. Ultimately we shied away from that idea (for the time being) so we didn’t take away that genuine interaction between the server and customer. The cool thing about Meplus1 is when you’re ready to go, simply set the tip amount you’d like to leave, close your tab and you’re on your way with an emailed receipt. We also solve the problem of lost and misplaced credit cards and ID’s at the bar. We put great emphasis on our security features that protect our Consumers and Merchants. We have five layers of security for each tab that is opened and closed in the app. This ensures each user’s account is authentic and prevents user fraud or a chargeback. One valuable layer of security is our geo-fence, which prevents users from dining and dashing. If a user has a tab that has not been closed, will close automatically once they walk out of our geo-fence. Our Merchants will have the luxury of collecting key data and analytics from each customer using Meplus1. This allows our merchants to market directly to their customers; creating incentives and rewards to offer for new and repeat business. Essentially, this will increase customer loyalty by creating a more genuine and pleasurable experience. Going into building this company, we knew this wasn’t going to be easy. Certainly we didn’t know it would take this long, but there was a steep road ahead of us. Our limited resources due to no Capital made that road even steeper. There were plenty of VC’s and Investors who wanted to fund us, but they weren’t bringing the right expertise to the table. Capital is one thing but taking Meplus1 to the next level was another. We knew cash, just wasn’t going to cut it. So we continued to build and 21 months later we have a fully functional product with an amazing team! Our biggest hurdle was finding the right people for our team. We interviewed and sorted through a lot of resumes, but like our Investor situation we couldn’t find the right people. Our company prides itself on opportunity and believing in a vision. Once we got the right people on board, Meplus1 became a reality. Another huge milestone for us was our partnership with Subtle Data™. This allowed us to directly integrate with major Point of Sale systems. Which in turn sped up production and kept cost down tremendously. This month (January) we were listed as one of the top 35 tech companies TechCrunch missed out on in December 2012. That was a big accomplishment for our company. Our next few milestones include: securing Series A funding, incorporate innovative features into the app, and expand into industries outside of the restaurant industry. Over the past year and a half we’ve had the pleasure of meeting a variety of influential people. Being able to sit and speak to them and get their advice is priceless. Two people we look to from time to time our partners at ApexTis Consulting. They have certainly been a huge asset to Meplus1. Other people we look up to are Ray Lewis for motivation, Warren Buffet for knowledge, and we watch a lot of Kevin Rose Foundation videos on YouTube. Being so far away from Silicon Valley definitely has it’s ups and downs. On the bright side Washington D.C. is a very busy place and once you know the right people, you’re pretty much good. We have a lot of tourists and business conventions that happen here throughout the year. Another advantage are the schools we have in such a small radius. Colleges and High Schools are plentiful in the Metropolitan area. The biggest disadvantage are the resources. People here mostly work for the government and don’t really look to invest their money into companies. There’s a lot of potential though, don’t get me wrong. We’re just not there yet, D.C.. When people want to start a tech company the first thing they think sometimes is “I need to go to Silicon Valley!” and most of them do. Which takes away opportunities from the few Investors and VC’s we do have here in the Nation’s Capital. What’s next for your Meplus 1? Meplus1’s next step is to launch in the coming weeks, continue adding to our talented team, and expanding our clientele. We plan to Launch on the iPhone platform initially. Then deploy our Android version by mid 2013.